Arc fault circuit interrupter breakers (AFCI’s) are designed to prevent fires by detecting electrical arcs in the circuits they are installed on and then disconnecting the power to that circuit before a fire can start. Arc faults are one of the leading causes of household fires. The arc fault breaker is designed to distinguish between intentional arcs that are the normal operating procedure for appliances, such as the brushes in a vacuum cleaner or electric drill and the switching on and off of a light switch or insertion and removal of electrical plugs and problematic arcs such as a worn electrical cord for a lamp or other appliance. Many fires are started when someone hangs a picture on a wall by driving a nail into the wall and unintentionally hits an electrical wire, thus creating an arc and possibly a fire. Arc fault breakers detect this type problem and will disable the circuit, preventing a possible house fire and alerting the occupants of the house of an unseen problem. 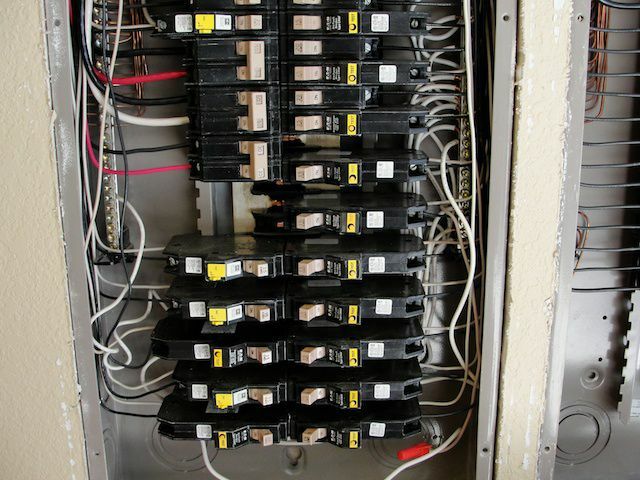 Conventional circuit breakers only respond to amperage overloads and short circuits. They do not detect erratic current flows that are created by unwanted arcing situations. AFCI’s are designed with specific circuitry to detect only the unwanted type arching. The AFCI continuously monitors the current flowing through the breaker and once an unwanted arching situation is detected, the control circuitry in the AFCI trips the internal contacts, which de-energizes the circuit, reducing the potential of a fire to occur. The “National Electrical Code” (NEC) began requiring AFCI circuitry in all bed room outlets in 1999. In 2002 the NEC changed the wording in the code to exclude the word “receptacle” and left the word “outlet” which in effect included all lights, ceiling fans and any other wired in devices. An outlet is defined as “a point on the wiring system where current is taken to supply utilization equipment”. The 2005 code clarified even more strictly to include wired in smoke detectors. As of January 2008 only “combination type” AFCI’s will meet the NEC requirements. Combination AFCI’s provide protection against parallel arcing (line to neutral), series arcing (a loose or broken wire), grounding arc (from line or neutral to ground), overload protection (resistance loads in heaters, electrical motors may require additional protection) and from short circuits. Combination AFCI’s are now required by the NEC in all 15 and 20 amp residential circuits with the exception of laundries, kitchens, bathrooms and unfinished basements. When noted on a home inspection report as a deficiency, the lack of AFCI’s is not a required upgrade. Some municipalities have not adopted the latest NEC codes into their code system and do not require installation of the devices. Most homes that exist today were built before these codes were adopted and are considered to be “grandfathered”. If considering a newly constructed home, the installation of AFCI’s should be required by the home buyer as they are a life safety product that could prevent loss and injury in the future. Upgrading to the installation of AFCI’s into older systems is a prudent consideration provided the current system is configured to accept the new AFCI breakers. Any upgraded service panel boxes should also be fitted with AFCI protection.